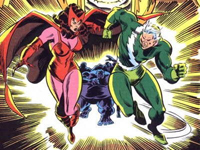 As hinted at in an interview with Joss Whedon last week, EW says that an unnamed source has confirmed that Scarlet Witch and Quicksilver will be assembling alongside Earth’s mightiest heroes when Marvel’s The Avengers 2 hits the big screen in 2015. Marvel Studios President Kevin Feige previously revealed that rights allow for the mutant siblings to appear in both the Marvel cinematic universe and in 20th Century Fox’s X-Men universe. Regardless of who ultimately assembles for the sequel, Marvel’s The Avengers 2 hits the big screen May 1, 2015.